Connecting PEX is relatively easy because of its flexibility that allows it to follow corners. 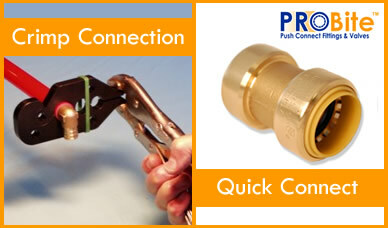 Two common ways of connecting PEX are by using crimp rings with a compression tool and push to connect technology. Compression requires tools and some understanding of how to compress the crimp ring to make a firm connection. Quick Connect Fittings require no special tools or plumbing experience. When installing PEX tubing with ProBite ® Push Connect ® fittings, you will need to cut the PEX tubing, clean it, and mark it just as you would with preparing for any other method of fitting connection. However instead of having to use crimp rings and special tools, you can simply push the fitting onto the PEX tubing until it reaches your mark and snaps tight. The fitting will make a tight leak free connection in seconds and you don't need to worry about under or over tightening.